In a large bowl mix together the flour, baking powder, salt and sugar. Then stir in the egg and orange juice. Last, fold in the orange peel, cranberries and nuts. Spoon it into a standard loaf pan that has been sprayed with cooking spray. And bake it up at 325 degrees for 50 to 60 minutes until if golden and cooked through. I love this bread sliced and toasted for breakfast. The photo is on Ani’s breakfast table– along with a cup of 8 oz. cream cheese beaten together with 1/2 cup orange marmalade. It makes the perfect topping– when you’re not counting your calories! 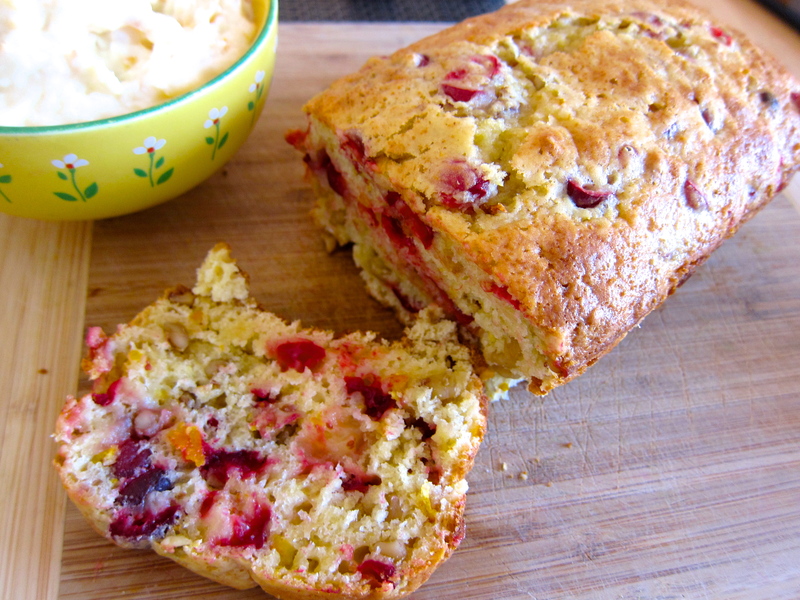 This entry was posted in Food and tagged baking, cranberry bread, orange, walnuts.. Bookmark the permalink. think you might be right! looks amazing! Looks like the best cranberry bread to me. I love cranberry bread! Love it here too– and I only make it Nov & Dec. I guess that makes it more of a treat! it’s not boasty – forty years to perfect it more than gives you the right! I’m making 10 small loaves of this tomorrows gifts for my small group. I’ve wanted the perfect recipe…and without even trying it I KNOW this is it!!!! I’ll let you know how it turns out!!!! That’s funny Andi!! I made 8 loaves this afternoon to take to school friends! Hey Brenda– Just made this to take up to the kids for Thanksgiving– The round loaves were some cardboard Christmasy pans I picked up at Target last Christmas, about 5″ across. This recipe makes one standard loaf pan of bread. The littlest foil pans from the grocery store work for 4 loaves from one recipe. And Target has rectangular baking cardboard pans for Christmas and two of those would take one recipe. Does that make sense? Happy Baking. P.S. How was your Thanksgiving with the kids?